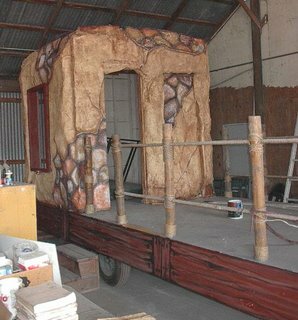 Here are some pictures of the pirate float I have been working on yesterday and today. 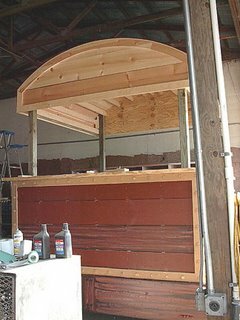 I was approached by a client that I had done some work for at his home and business and asked if I could help them with their priate float. Its some sort of benefit thing but they have it in the Gasperilla parade every year in Tampa which according to police estimates draws about 500,000 people, so its a big deal. Anyway the float is nothing more than a flat bed trailer about 40 feet long with a structure on the back and it had a raty looking tiki bar on the front. I told them to get rid of the tiki bar and I designed a treasure chest to put there instead. they also had the thing painted all seafoam green and pink and other colors that have nothing to do with priates. they are going to put some benches down the middle but the whole thing is they get about 12 to 15 people on it and drink a lot of beer and toss out beads and plastic coins. the first picture is the front of the float. I designed this to look like a treasure chest and they did a good job of building it. I am painting the wood a reddish brown and the trim will be a metallic gold. The idea is to stand in the treasure chest and throw out beads and coins, etc. the next picture is the back of the float. This structure was already existing and they wanted to keep it and asked me if I had any ideas for it. So I thought it would make a good jail. It was painted some aweful color I so I painted it to look like plaster that had broken away revealing stone in places. there is a window on each side and they are going to put bars there. you can see how I painted the sides of the flatbed to look like wood planks. I still have about another 2 days on it before my part is done.